American policymakers are trying to downplay any role the Muslim Brotherhood will play in an emerging Egyptian government, saying only that President Hosni Mubarak's successors must be open and tolerant of religious minorities and govern an open society. Statements by senior policy officials to the media and before congressional committees since Mubarak's Feb. 11 resignation show that the Obama administration does not consider the Brotherhood to be an extremist organization, despite its written commitment to creating an Islamic state and its leadership's history of threats and hate speech. The Brotherhood made good Monday on its pledge to form a political party, called the Freedom and Justice Party. General Guide Muhammad Badie said the party is open to everyone, provided they "accept its platform and tendencies." That platform hasn't been issued yet. United Nations Ambassador Susan Rice minimized the Brotherhood's potential power Sunday during an appearance on NBC's Meet the Press. "There's no indication that the Brotherhood is going to dominate Egyptian politics," she said. Host David Gregory noted the Brotherhood's standing platform "would seek 'the preservation of honor' by stoning adulterers, punishing gays, requiring Muslim women to cover their heads and shoulders in public and killing Muslims who leave their faith." Rice did not address those positions, but indicated that the U.S. favored a deliberate path toward Egyptian elections, giving time for other parties to organize. President Barack Obama discussed the Brotherhood in similarly broad terms in a pre-Super Bowl interview with Fox News' Bill O'Reilly. "I think that the Muslim Brotherhood is one faction in Egypt. They don't have majority support in Egypt," Obama said. "But they are well-organized and there are strains of their ideology that are anti-U.S. There's no doubt about it." During an impromptu news conference on Capitol Hill last week, Secretary of State Hillary Clinton said Egypt needs to build a system with checks and balances to guarantee lasting reform. "Because, as I've said many times before, democracy is not just about one election where whoever wins it never wants to have another election," she said. "You need an independent judiciary, a free press. You need an independent support for minority rights. And there's just so much else that goes into what democracy represents." In hearings before House and Senate committees earlier this month, officials rarely mention the Brotherhood by name. Instead, they use language similar to Deputy Secretary of State James Steinberg, who told the House Foreign Relations Committee Feb. 10 that "we have to be clear about what anybody joining a government would be expected to be committed to. And that commitment is to an open tolerant society that allows for religious diversity, for differences of opinion, that doesn't undermine civil society, that supports an open discourse among all elements of society, and rather than trying to anticipate what any particular member organization is, that we hold to those principles." But officials aren't saying what would happen if that government is deemed too stringent on any of these ideals. "And if they do not," Steinberg told the House committee, "then we will be clear about what our position is." Members of Congress have been more direct in expressing concern about the Brotherhood's possible ascendancy. U.S. Rep. Ileana Ros-Lehtinen, R-Miami, presided over a two-part Foreign Affairs committee hearing that focused on recent Middle Eastern upheaval. "The Muslim Brotherhood," she said, "had nothing to do with driving these protests and they and other extremists must not be allowed to hijack the movement toward democracy and freedom in Egypt." Democrat Howard Berman of California expressed skepticism "about the Muslim Brotherhood's commitment to democracy" and warned that "even in the best case scenario," the group would "try to influence the Egyptian government in ways that undermine U.S. interests and that will make Egypt a regressive and less tolerant place." U.S. Rep. Jeff Duncan, R-S.C., tried in vain to pin Steinberg down. He received no direct answer when he asked, "Is the administration actively working to prevent the Muslim Brotherhood from being involved in this process of new government in Egypt?" Steinberg said he didn't want to single out an individual group and repeated the administration's goal "that the government that emerges is an inclusive, tolerant, democratic one that respects the rights of women, minorities, religious minorities and the like." The United States would not support government involvement of "any group that isn't consistent with that." Rep. Ann Marie Buerkle, R-N.Y, also asked whether the administration is trying to block the Brotherhood from gaining power. Steinberg again did not provide a direct answer, saying "these transitions can be difficult and they can lead to unpredictable results." The U.S. cannot dictate outcomes for Egyptians, he said. "And we want to make sure that the process is not hijacked by extremists or those who do not deeply believe in the open and tolerant and democratic process that we want." 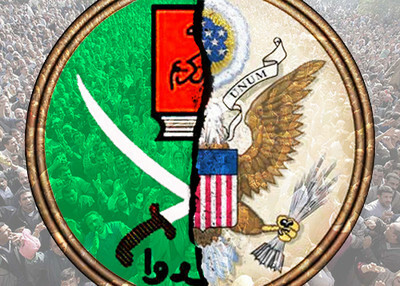 According to America's two top intelligence officers, however, there's nothing inherently radical about the Muslim Brotherhood. Speaking to the Senate Intelligence Committee, Director of National Intelligence James Clapper acknowledged he committed a faux pas when he called the Brotherhood "largely secular." But Clapper and CIA Director Leon Panetta declined to call the group radical. There are extremist elements in the Brotherhood, they said. One of those elements, spiritual leader Yusuf al-Qaradawi, returned to Cairo to deliver a sermon after prayers Friday. Qaradawi, who has prayed for the chance to kill a Zionist and to be killed by an infidel, made a point of praising Coptic Christians. But he also went out of his way to say he hoped to lead a similar ceremony in Jerusalem after "the conquest of the Al-Aqsa Mosque." Brotherhood officials, meanwhile, are more openly expressing their intentions for Egypt's future. Kamal Helbawy, a leader of the group's older guard, told Iranian media that the Egyptian revolution was an Islamic one. He also indicated the 32-year-old peace treaty with Israel was not something the Brotherhood accepts. "People of Egypt cannot accept an agreement which is based on injustice and has ignored the rights of Palestinians."